Gator XUV560. Photo provided by John Deere. 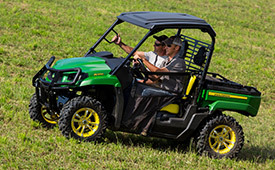 The John Deere Gator XUV560 Crossover Series utility vehicle offers professional landscapers an affordable, comfortable and versatile 4×4 solution. Powered by a 34.8 cu. in. V-twin gasoline engine, the 16-hp Gator swiftly accelerates up to 28 mph, enabling landscapers to quickly get from job to job. With a towing weight of 1,100 lb. and payload capacity of 800 lb., the XUV560 allows professionals to tackle bigger jobs. Additionally, the XUV560 is equipped with an extra-durable, one-piece cargo box that ensures hard-driving performance and longevity.